Color(s): White with black, yellow, or fawn markings. The Portuguese Podengo comes in three sizes: Pequeno (small), Medio (medium), and Grande (large). This is an ancient sight and scent hound that originated in Portugal. This breed is considered in Portugal to be the National Breed, and is quite rare in the United States. 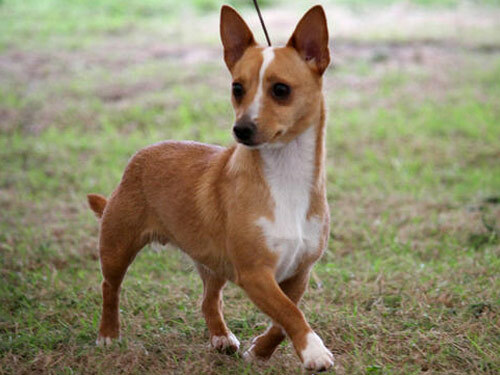 The Portuguese Podengo was primarily bred for hunting rabbits and was never intended to be a pet. The Portuguese Podengo breed is alert, active, enthusiastic, and lively. Due to the absence of repeated human intervention, the Podengo adapts perfectly to the environment, climate, and hunting functions. They are an extremely hardy breed that are capable of thriving in the heat or snow; indoors or out. The Portuguese Podengo is happy, cheerful, and good-natured. They are loyal and extremely devoted. This breed is good with older considerate children and friendly toward strangers. Portuguese Podengo's generally get along well with other dogs. Although congenial, they make an excellent watchdog and will alert their family by barking. Due to their primitive nature, this breed is not recommended for first time dog owners. Portuguese Podengo's require occasional combing or brushing to remove loose and dead hair. Dry shampooing will suffice. Dental hygiene is extremely important. The Portuguese Podengo is quite healthy due to limited human intervention. The Portuguese Podengo's coat comes in two varieties: Smooth or Rough. The smooth coat is of medium length and hard in texture. The rough coat is longer in length, coarse in texture, and shaggy in appearance. This breed is an average shedder. The Portuguese Podengo breed requires basic obedience and socialization training beginning at an early age. The Portuguese Podengo learns quickly but does not respond well to harsh or heavy-handed training methods. Training in the area of agility should never be done before the age of six months to protect their growing bones. The Portuguese Podengo is not recommended for apartment living. They require a securely fenced yard for a lot of daily exercise. Fencing should be a minimum of 6 feet in height, and also buried into the ground. It is never a good idea to play tug-of-war with this breed. The Portuguese Podengo benefits from the companionship of daily walks. They excel in agility, fly-ball, hunting, and tracking.